is an Alabama-based small business which was founded in 1995. OSC manufactures custom sensor test equipment and provides high quality technical and engineering support services to the U.S. Army, NASA, and private aerospace/defense corporations. We are located within the Research Park business district of Huntsville, Alabama. OSC maintains a 7000 square foot office complex including office space and laboratories. The north Alabama area is home to numerous defense, aerospace, and engineering firms. In addition, Huntsville is home to the U.S. Army's Research Development and Engineering Command (RDECOM), Space and Strategic Defense Command (SSDC), and NASA's Marshall Space Flight Center (MSFC). Since 1989, Optical Sciences Corporation personnel have been active members in the development and operation of the Hardware-In-the-Loop (HWIL) facilities within the Aviation and Missile Research, Development and Engineering Center (AMRDEC) of the Research Development and Engineering Command (RDECOM) at Redstone Arsenal. Central to this effort has been the development, characterization, operation, and maintenance of state-of-the-art dynamic infrared scene projection technologies. 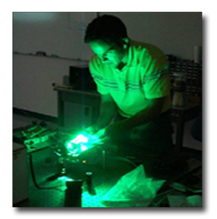 Optical Sciences Corporation has leveraged this experience into the development of several commercially available infrared scene projector and test set systems. Optical Sciences Corporation personnel have also provided years of support to MSFC's Structures and Dynamics Laboratory. OSC personnel provide critical data analysis and interpretation for the acceptance testing of the Space Shuttle Main Engine. Since founded in 1995, OSC has manufactured custom infrared test equipment and provided high quality technical and engineering support services to the U.S. Army, NASA, and private aerospace/defense corporations.